Presents up-to-date Banach space results. * Features an extensive bibliography for outside reading. * Provides detailed exercises that elucidate more introductory material. 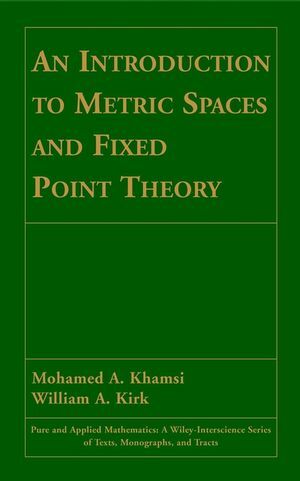 An Introduction to Metric Spaces and Fixed Point Theory includes an extensive bibliography and an appendix which provides a complete summary of the concepts of set theory, including Zorn's Lemma, Tychonoff's Theorem, Zermelo's Theorem, and transfinite induction. Detailed coverage of the newest developments in metric spaces and fixed point theory makes this the most modern and complete introduction to the subject available. MOHAMED A. KHAMSI, PhD, is Professor in the Department of Mathematical Sciences at the University of Texas at El Paso and visiting Professor in the Department of Mathematics at Kuwait University. He is also co-author of Nonstandard Methods in Fixed Point Theory. WILLIAM A. KIRK, PhD, is Professor in the Department of Mathematics at the University of Iowa, Iowa City, Iowa. He has authored over 100 journal articles and is co-author of Topics in Metric Fixed Point.